"Even the big guys got no respect"
Mosasaurs were the largest predators in the shallow sea that covered Kansas during the Late Cretaceous. But being the top predator was no guarantee for survival, especially since they were living with giant sharks like Cretoxyrhina mantelli that were competing for the same prey, and always looking for a chance to feed on a sick or injured mosasaur. It was a dangerous place to live, especially for the younger, smaller mosasaurs. Mosasaurs lived for 20 or more years, and non-fatal injuries sometimes occurred during their lifetime. 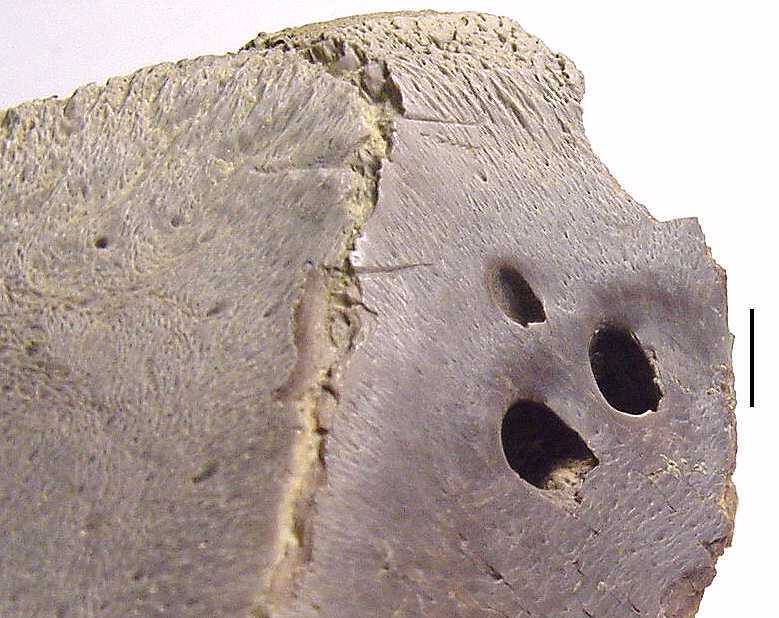 Records of these injuries are occasionally preserved in preserved in the fossil record. 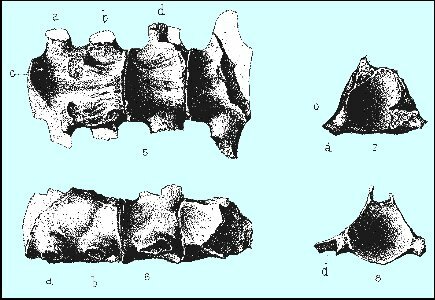 Dollo (1882) coined the name Plioplatecarpus Marshii to include a new kind of mosasaur with fused pygal vertebrae that formed a sacrum. 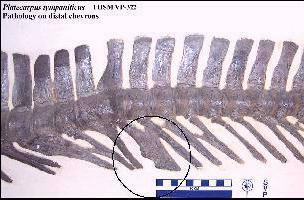 No other mosasaur then or now is known to have a sacrum. 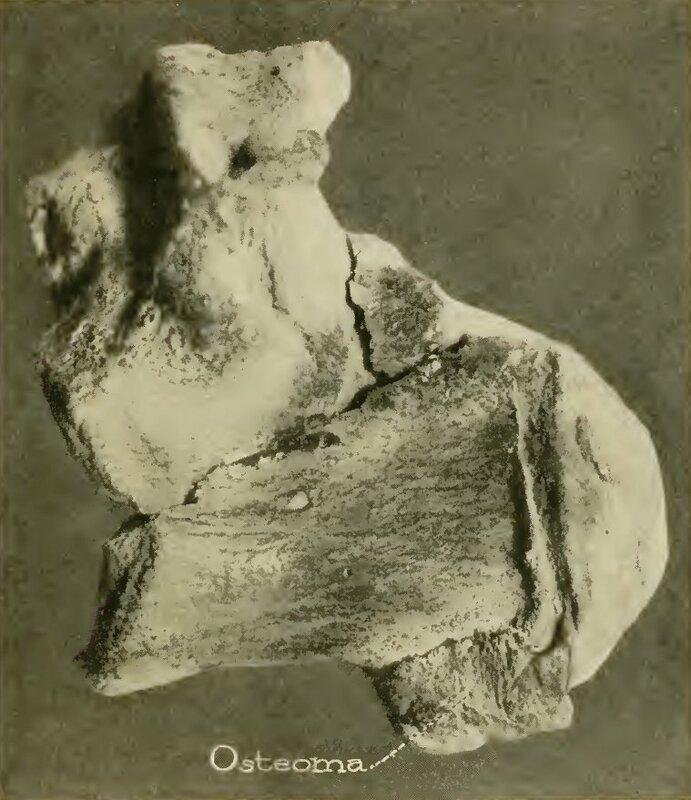 By 1892 (page 221), however, Dollo realized that the fused vertebrae represented a disease or pathology. LEFT: Plate V from Dollo 1882 showing the fused pygal vertebrae of the type specimen of Plioplatecarpus in ventral (5), right lateral (6) and end (7-8) views. c. Tubercule précurseur des éminences où viennent s’articular les chevrons de la région caudale. The two specimens cited by Dollo were identified and figured by Mulder (2001, Fig. 2) as IRScNB 1496 and 1497 in the National Museum of Belgium. LEFT: Albert Gaudry (1890) was probably the first identify and illustrate fused vertebrae in the tail of a mosasaur as a pathology, in this case, the tail of Mosasaurus hoffmanni. The caption reads "Portion of the tail of Mosasaurus camperi, one ninth of size, showing two instances of bone disease. - Chalk of Maestricht. Collection of the Museum. " MNHN AC 9649-9775 - see Mulder 2001, Bardet 2012. Professor Benjamin F. Mudge (1878) was one of the first American paleontologists to discuss mosasaur pathology. He had been collecting mosasaurs in western Kansas since the late 1860s and at the time had probably seen more mosasaur remains than anyone else. Writing about the geology of Kansas in the U.S. Geological and Geographical Survey of the Territories (Hayden, 1878), Mudge described several of the injuries he had seen in mosasaur bones. He noted (page 287) that "Sharks' teeth were sometimes found in the remains of food, showing the taste of the Saurians and their high carnivorous natures. On the other hand, we frequently found evidence that the sharks returned the compliment, for bones of Saurians were found with the marks of the sharp, serrate teeth of Galeocerdo, which could not have been made unless the bones were still fresh and unhardened. That such huge reptiles must have had fierce contests with each other is also apparent. 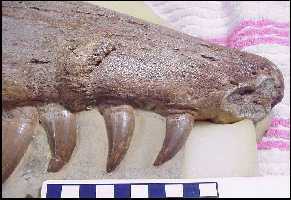 The type of the head and teeth would indicate this. But in addition it was no uncommon thing to find Saurian ribs which had been broken and again united while the animal lived. In one case a more serious injury occurred. In a fine specimen, one of the most perfect collected by us, we discovered that the animal had received a very serious injury to his back, which he had outlived. Five of the vertebrae had been fractured so seriously as to lose many of the spinous processes, after which it had healed, but the whole had grown together (anchylosed) so as to lose the natural form of the separate bones and become a confused, firm mass. The enemy that could have thus injured a monster 35 or 40 feet in length, and whose jaws of defense were 33 inches long, must have made a fierce contest." LEFT: Mosasaur rib (FHSM VP-4516) in the Sternberg collection with healed fractures. 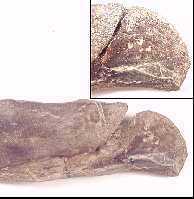 RIGHT: Mosasaur rib (FHSM VP-3366) of Tylosaurus kansasensis in the Sternberg collection with healed fracture, and subsequent bite marks from Squalicorax falcatus. 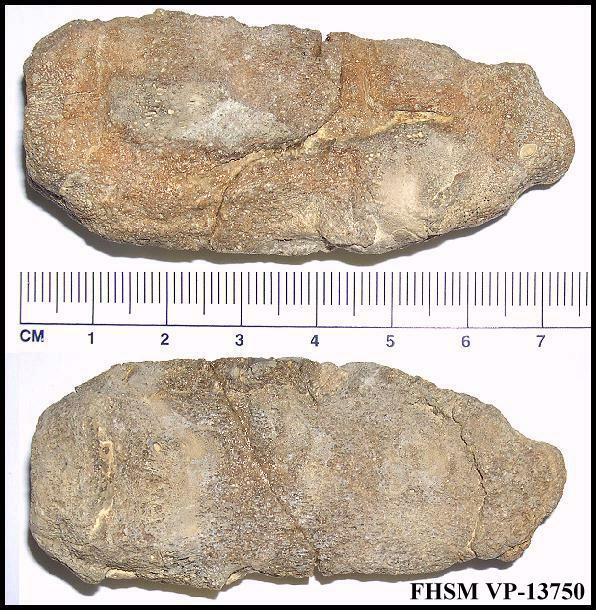 LEFT: A recent photo of a second broken and healed rib of FHSM VP-3366 (above right) on exhibit in the Sternberg Museum of Natural History. In this case, the tylosaur survived some kind of violent encounter that broke at least two of its ribs... lived long enough for the ribs to heal, then died and was scavenged by sharks, as evidenced by the serrated bite marks on both ribs. FHSM VP-3366 is a fragmentary specimen of Tylosaurus kansasensis, with a partial skull (including the diagnostic premaxilla and a right quadrate), twenty-four cervical and dorsal vertebrae, rib fragments (two with a healed fractures), and preserved thoracic cartilage. Scavenging by Squalicorax falcatus is indicated by serrated bite marks on the remains, including adjacent to the healed rib fractures. Collected by R.L. Bliss in April 1972 from the lower Smoky Hill Chalk of southeast Gove County. "Fig. 7. 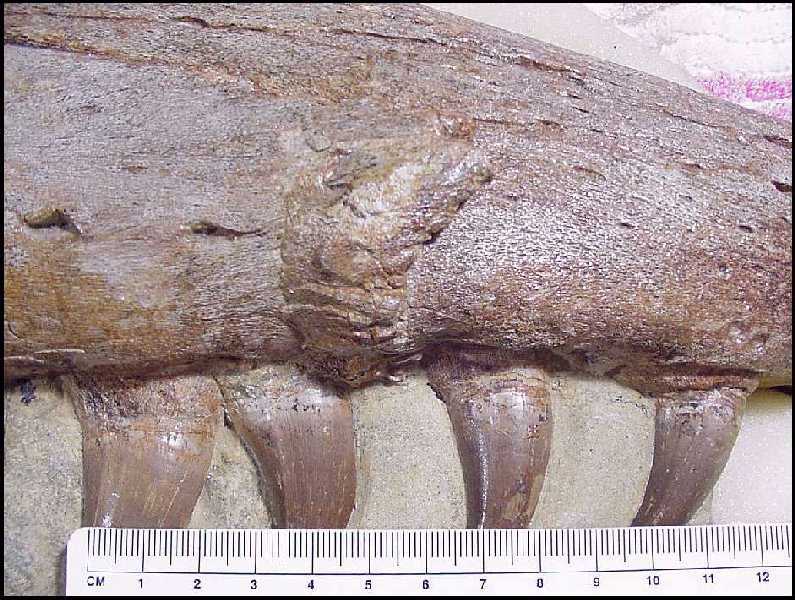 – An example of Mesozoic pathology seen in the flat exostoses developed on the humerus of a mosasaur, an aquatic reptile, from the Cretaceous chalk of western Kansas. The pathology has been diagnosed as that of osteoperiostitis, with arthritis deformans, indicating by the lipping of the joint surfaces. 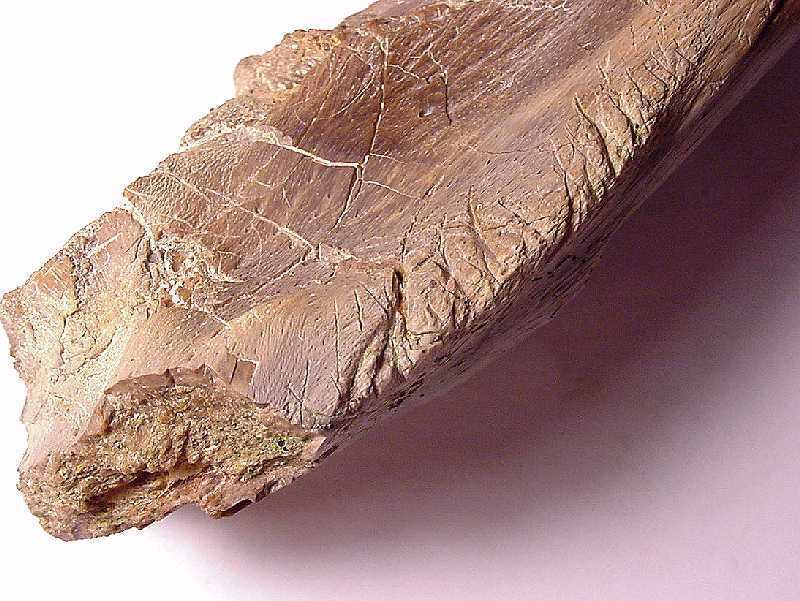 The bone, though flat in its fossilized condition, was more rounded in life. Normal bones have smooth surfaces. The pathological excrescences indicate the presence of bacteria or other irritant under the periostium. Microscopically the osseous outgrowths differ from normal bone." "Fig. 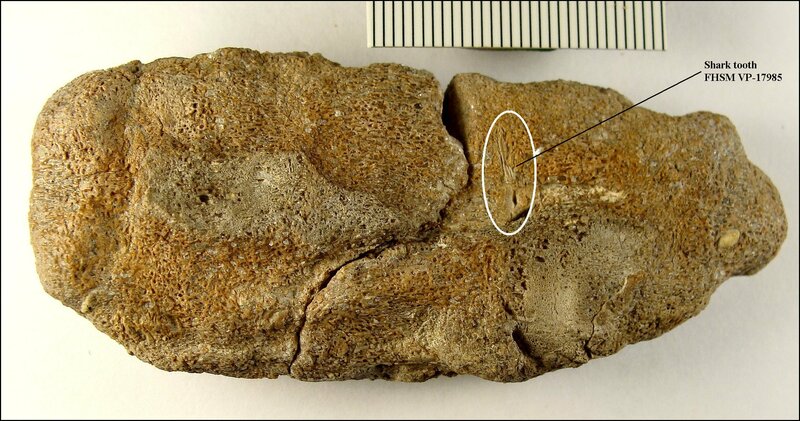 9 – A Mesozoic osteoma, the oldest known, seen on the dorsal vertebrae [sic] of Platecarpus, a Cretaceous mosasaur from western Kansas. The osteoma is a definite outgrowth from the body of the bone; natural size." 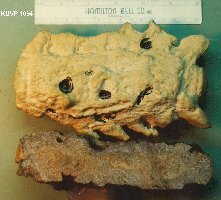 LEFT: Photograph of the cast of fused mosasaur vertebrae (KUVP 1094) and the actual specimen in cross-section, described by Martin and Rothschild (1989) and Shimada (1997). 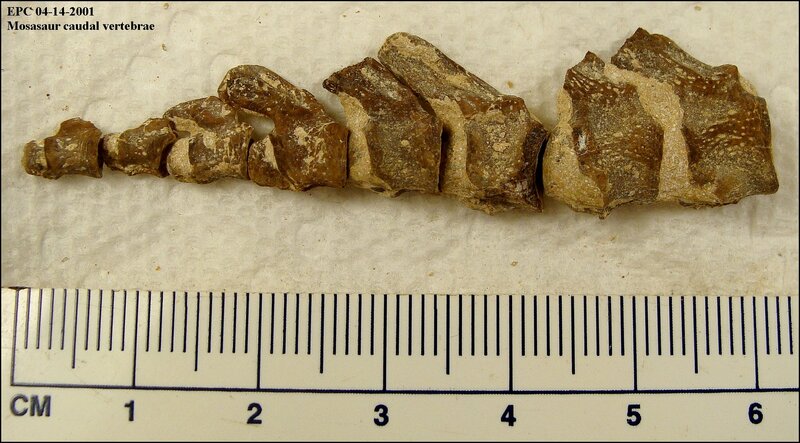 The exostosial bone growth that fused four caudal vertebrae together was apparently the result of an infection caused by a shark bite. 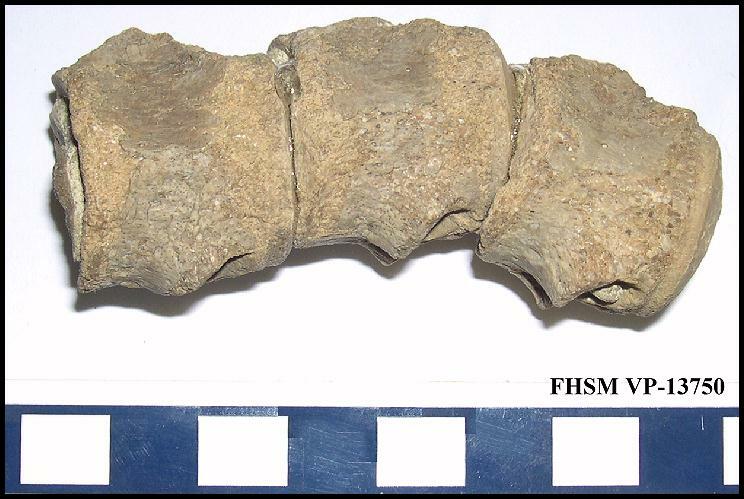 LEFT: Three fused vertebrae near the end of the tail of a small mosasaur (FHSM VP-17984). It appears that the bone was severely infected, possibly as the result of a bite. 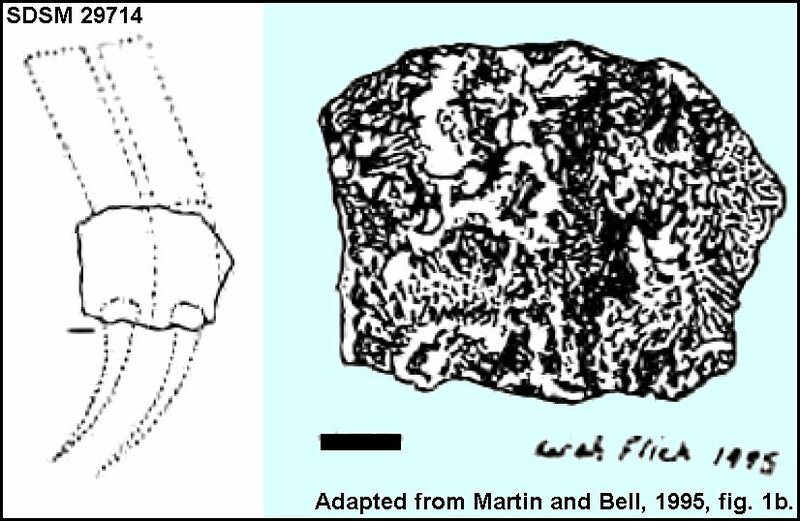 A similar but much larger fragment was discussed by Martin and Rothschild (1989-Above) who noted that the fused vertebrae contained the fragment of a shark tooth. 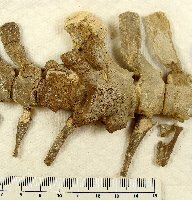 RIGHT: A closer view of the three fused vertebrae (right lateral view, anterior to the right). RIGHT: The tiny vertebrae at the end of the mosasaur tail above. At about 0.5 cm each, these are the smallest mosasaur vertebrae I have ever collected. LEFT: The same fused vertebrae as above, in left lateral view. 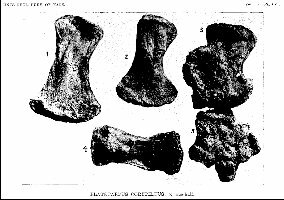 Mudge's student and co-worker, S. W. Williston (1898, p. 214) noted, "That they [mosasaurs] were pugnacious in the extreme is very evident from the many scars and mutilations which they suffered during life. I have observed exostosial growth in their lower jaws, the vertebrae, especially those of the tail, and the paddles, especially the digits. In some the mutilations have been extensive. One tail of a Platecarpus has the spines of the distal half of the tail broken off and false joints produced. Never have I known a case where there has been evidence of ante-mortem loss of the tail, or any part of it. A paddle of another specimen, figured in part in plate LVI, has the bones of the forearm, carpus and metacarpals all united by exostosis." 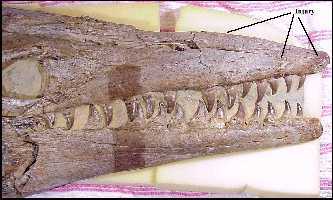 Williston was probably the first to photograph and publish an image of a pathology in mosasaur remains. Williston (1904, p. 49) said "As I have previously remarked, it is certain that all mosasaurs did not die of old age. 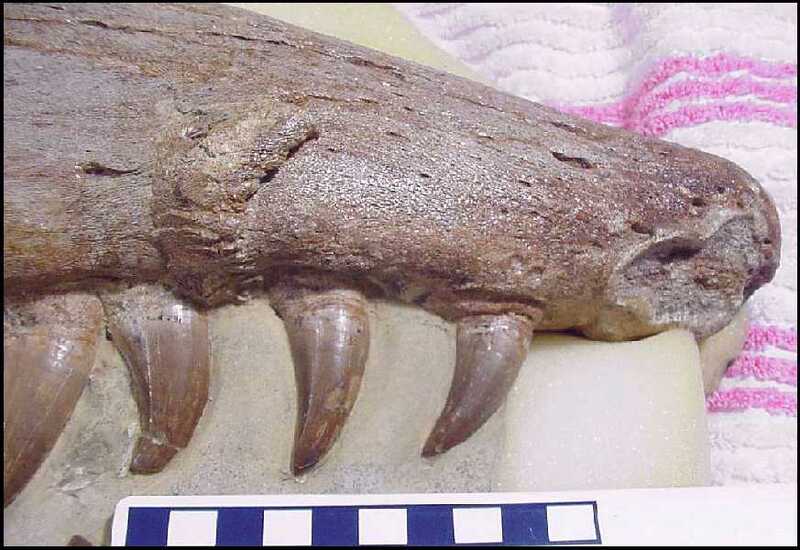 Indeed, the many hyperostosial mutilations of antemortem origin indicate only too well the fierce struggles the mosasaurs had with the carnivorous enemies of their own and other kinds. 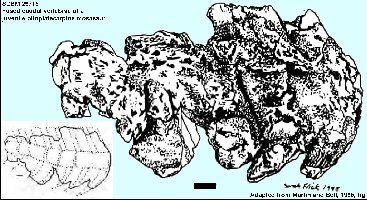 LEFT: In 1992, my wife found a similar specimen in the chalk (early Santonian) of Trego County, Kansas. 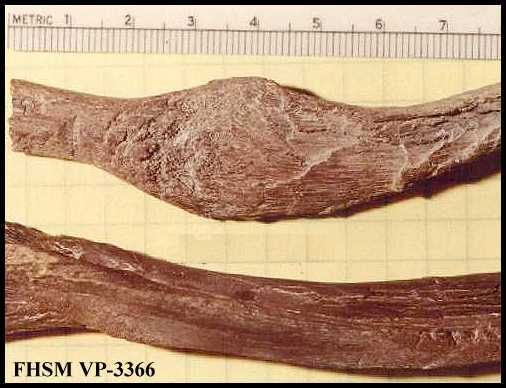 In this example, upper limb bone (humerus) was crushed, probably by the bite of a larger mosasaur, and had begun to heal crookedly. The humerus, radius and ulna appeared to have been involved in an infection related to the original bite. The specimen was found by itself, so the limb may have been torn from the mosasaur by scavengers. 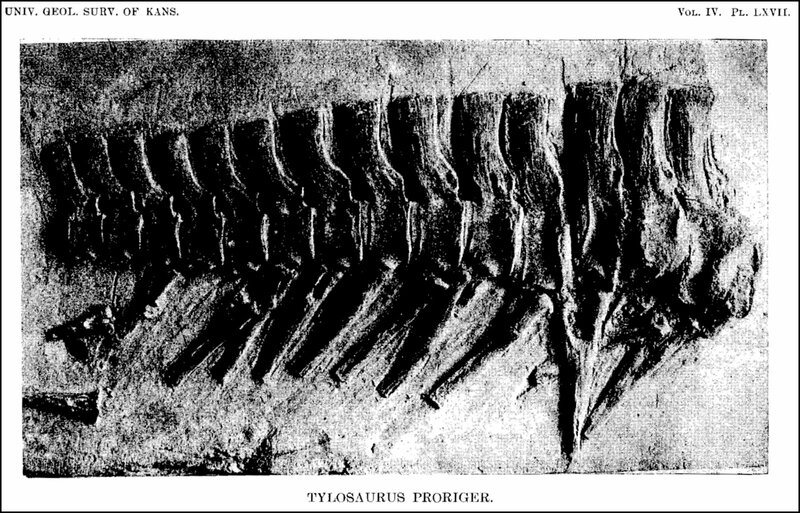 Charles Sternberg (1909, p. 50), in his discussion of Tylosaurus proriger, suggested that "...many of the ankylosed bones which we fossil hunters often find in the chalk of the Niobrara Group of the Cretaceous were broken by blows from these ram-nosed lizards." Later (1914, p. 161), Williston enlarged somewhat on his previous statement: "That the mosasaurs were pugnacious in life is conclusively proved by the many mutilations of their bones that have been observed, mutilations received during life and partly or wholly healed at the time of death. Bones of all vertebrates are repaired after injury by the growth of more or less spongy osseous material about the injured part, forming sort of a natural splint. This material is more or less entirely removed by absorption when it is no longer required for the support of the broken ends. Many such injured bones of the mosasaurs have been found; sometimes the bones of the hands and feet have grown together, and not infrequently the vertebrae have been found united by these osseous splints; occasionally even the skull itself, especially the jaws, attest extensive ante-mortem injuries. In a single instance the writer has observed the loss of a part of the tail, where it probably had been bitten off. It may be mentioned, however, that the bones of the tail had no such "breaking points" in the mosasaurs as have those of many land lizards, whereby a part or all may be lost as a result of even a trivial injury." LEFT: One of the more complete Platecarpus tympaniticus specimens (FHSM VP-322) in the Sternberg Museum collection shows an unusual accumulation of damaged and healed bones near the end of the tail, as well as a front limb and the skull. The mosasaur is about 6 m (20 ft.) long. 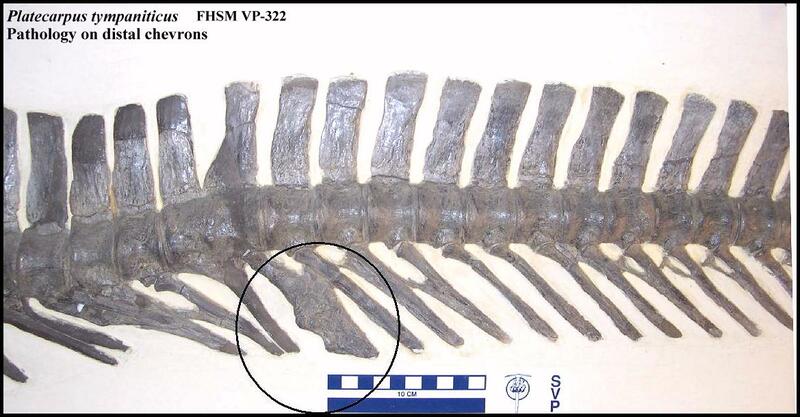 The end of the tail of FHSM VP-322 has two vertebrae that are fused together, and two other places where the chevron bones below the vertebrae are also fused or misshapen. 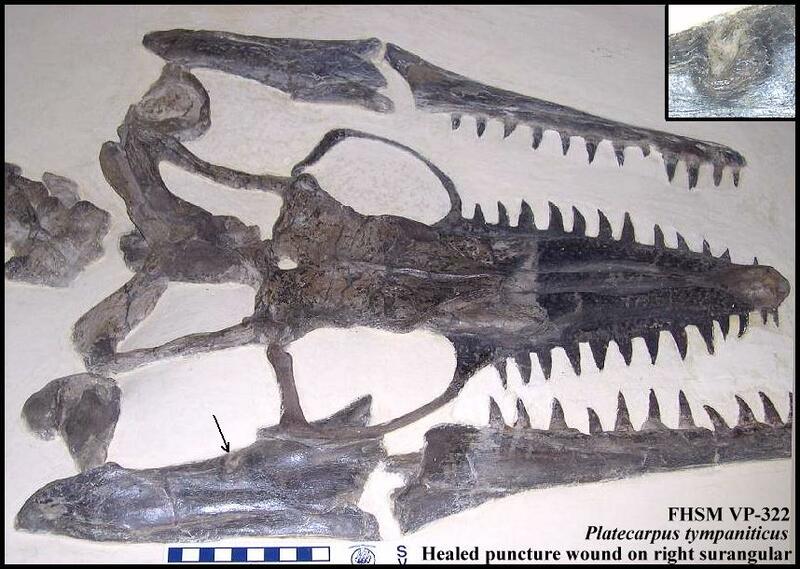 The skull and left front paddle show healed puncture wounds that may have resulted from the bite of another mosasaur. 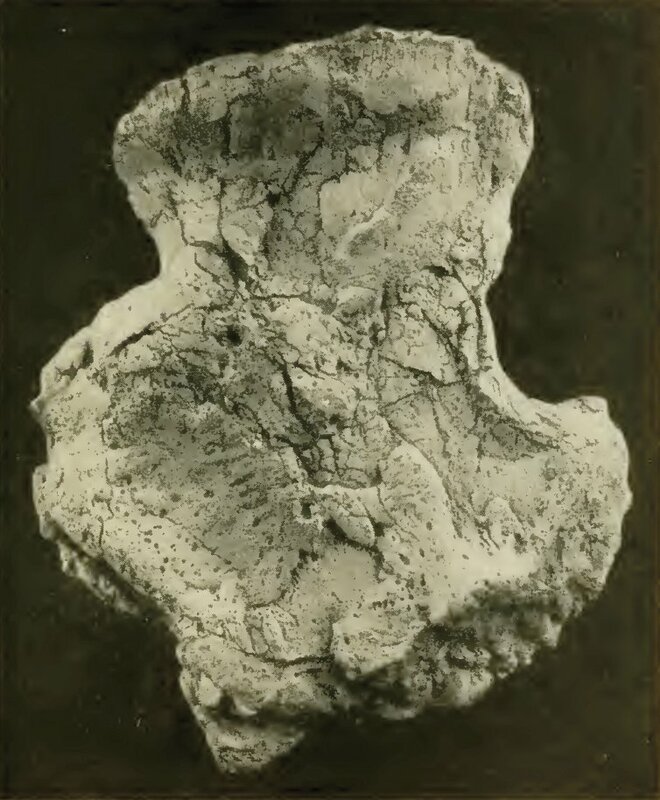 The specimen was collected by G. F. Sternberg from the Smoky Hill Chalk of Gove County in 1949, and was exhibited for many years in the original Sternberg Museum on the campus of Fort Hays State University. 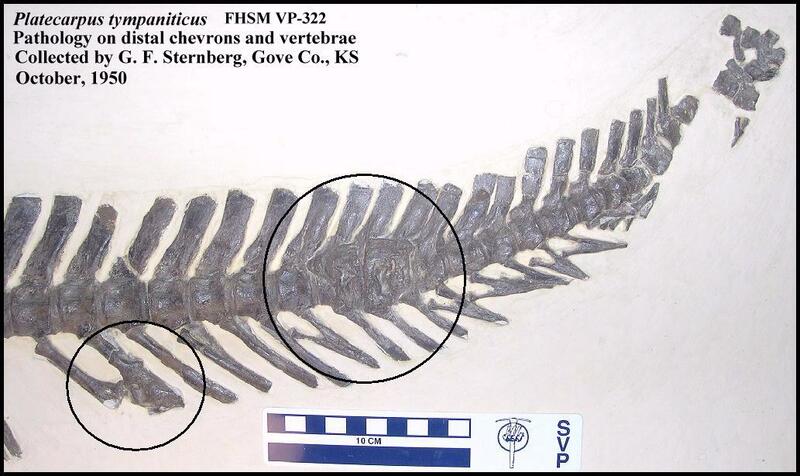 LEFT: The two damaged vertebrae (right circle) are probably evidence of a bite to the mosasaur's tail that became infected, and resulted in bone growth that fused them together. This wound is curious because neither the dorsal processes above the vertebrae or the chevrons below them appear to have been damaged by the bite or the resulting infection. 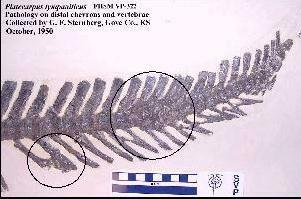 The left circle shows two chevron bones that were fused together. 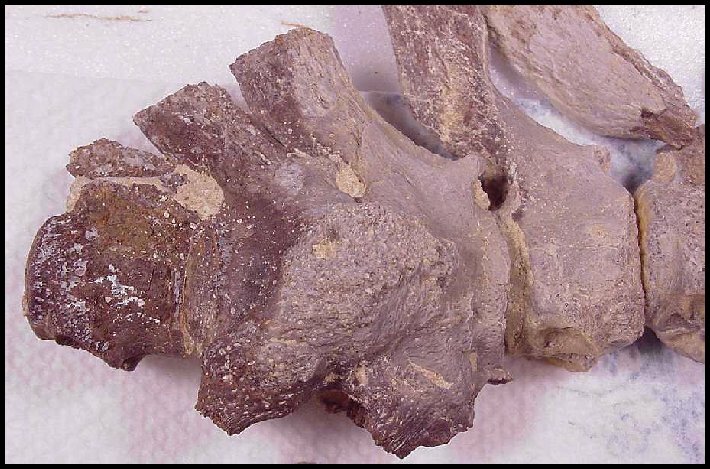 RIGHT: A close-up of the damaged vertebrae showing how the damaged vertebrae have grown together. 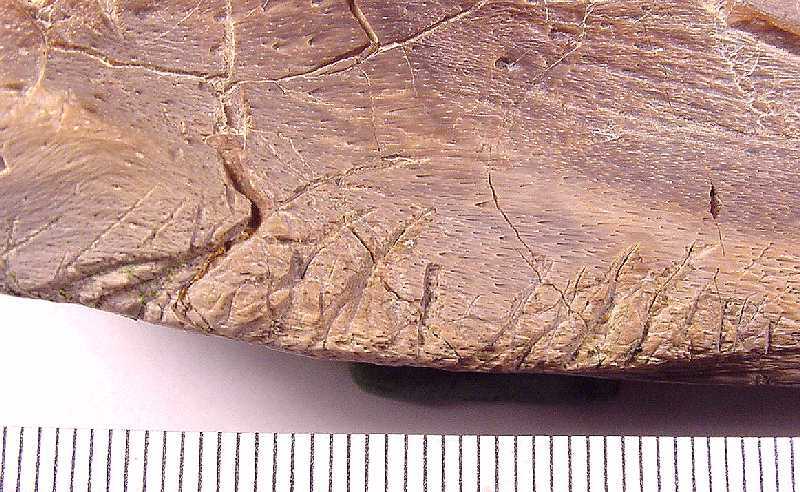 LEFT: Slightly forward of the healed injuries shown above, there is evidence of another injury to the chevron bones that resulted in pathological bone growth. Reconstruction in this area by Sternberg may have modified the actual damage. 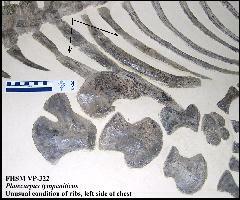 RIGHT: The anteriormost ribs on the left side of the rib cage are expanded and do not appear to be normal. This may also be the result of preservation or preparation. 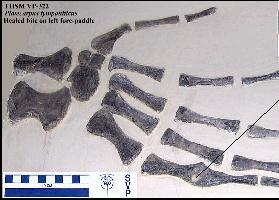 LEFT: A healed puncture wound to the first finger of the left paddle has fused the joint between two of the paddle bones. 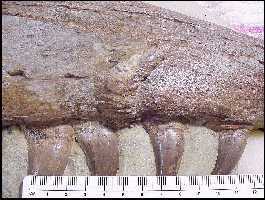 RIGHT: A healed puncture wound is visible on the top of the right surangular (back of the lower jaw). 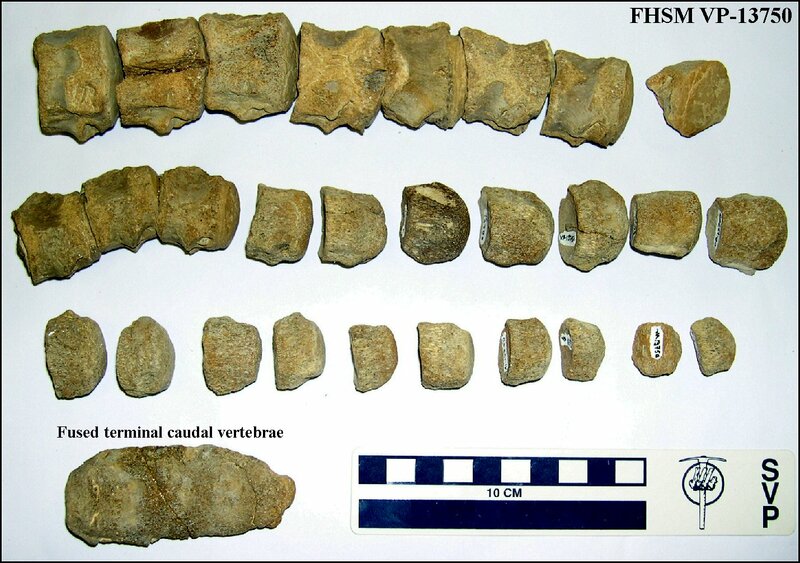 LEFT: Seven fused caudal vertebrae of a juvenile plioplatecarpine mosasaur SDSM 29715) from the Pierre Shale of South Dakota. Reported by Martin and Bell, 1995. Scale bar = 1 cm. 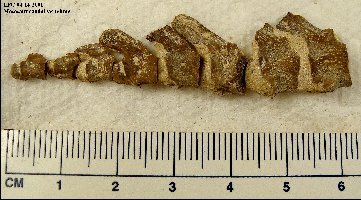 RIGHT: Two fused caudal vertebrae of a juvenile plioplatecarpine mosasaur SDSM 29714) from the Pierre Shale of South Dakota. Reported by Martin and Bell, 1995. Scale bar = 1 cm. 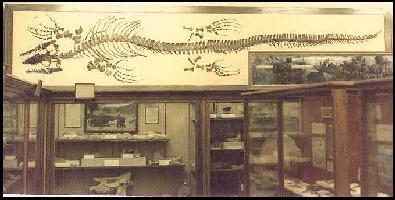 Martin and Bell (1995) described two examples of “club tailed” mosasaurs from the Pierre Shale of South Dakota. 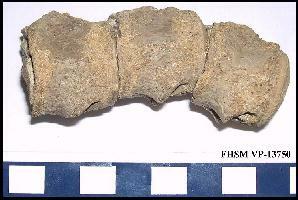 One of the specimens, a juvenile Clidastes had seven caudal vertebrae fused into a solid mass. 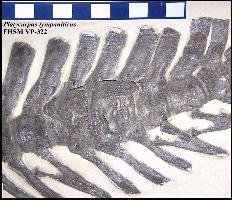 The other was a plioplatecarpine (Tylosaurus or Plioplatecarpus) which had three fused caudal vertebrae. They also reported that all of the “club-tailed” mosasaurs they had seen were juveniles. The specimen below most likely came from a juvenile Tylosaurus. 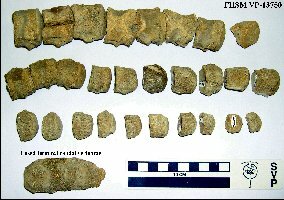 LEFT: At first glance, this pile of mosasaur caudal vertebrae (FHSM VP-13750) appeared to be evidence of just another mosasaur tail bitten off by a large shark and partially digested before being regurgitated. 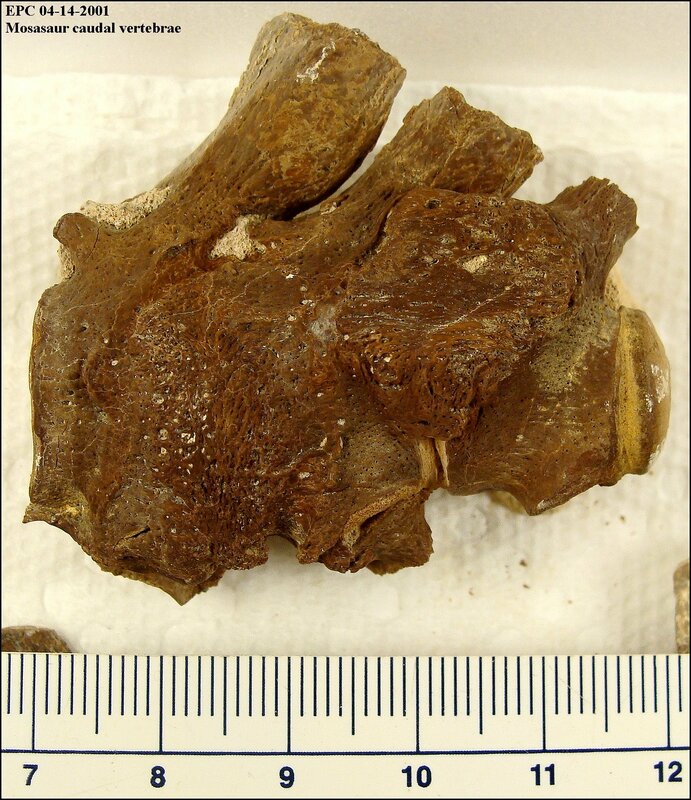 However, the odd shaped lump of bone in the lower left turns out to be at least 3 and probably 4 caudal vertebrae that have been fused together as the result of an infection. It appears likely that the mosasaur had the end of it's tail bitten off by an unknown predator (probably a shark). The wound became infected, fusing the vertebrae and more or less forming a bony club at the end of the tail as it healed. The mosasaur survived the initial attack but then was "sliced and diced" some time afterwards by a large shark, most likely Cretoxyrhina. LEFT: The fused terminal vertebrae at the end of the mosasaur's tail. 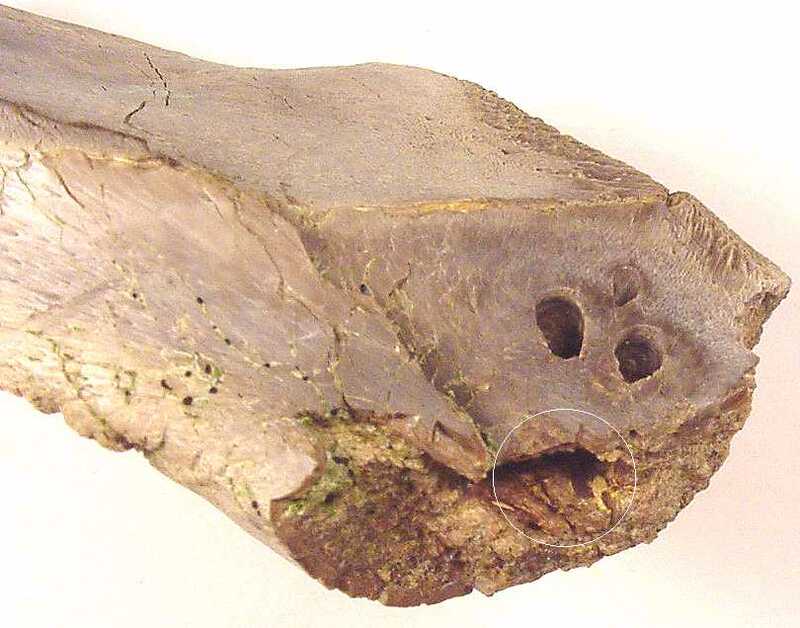 The number of vertebrae included in this lump of bone is uncertain because of the bone growth and the subsequent partial digestion inside the stomach of the shark. 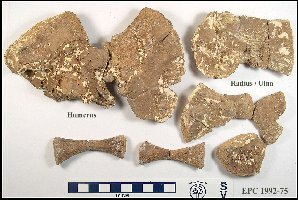 RIGHT: A series of caudal vertebrae from the same specimen, showing the effect of stomach acid on the surface of the mosasaur bone. 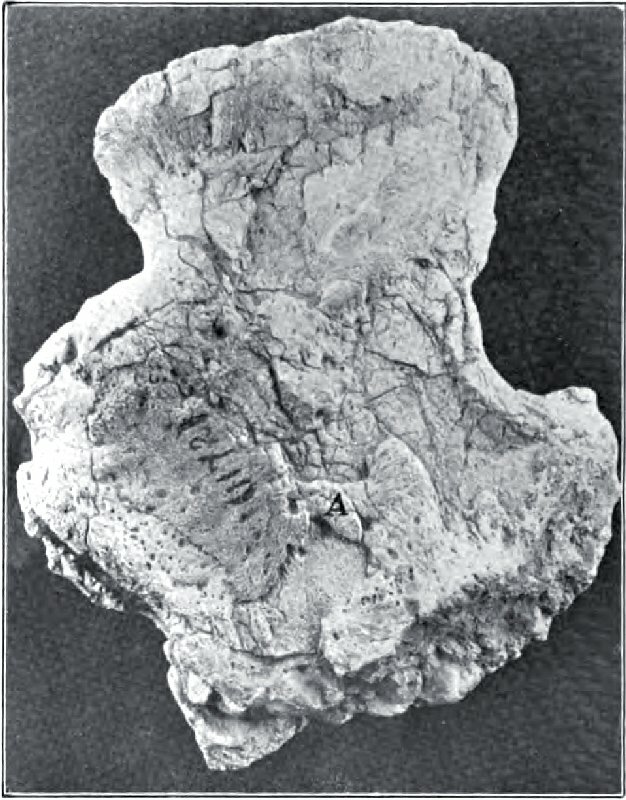 LEFT: Fused vertebrae in the tail of Plotosaurus bennisoni Camp, 1951 (CIT 2756). Figure adapted from Lindgren, et al. 2007. In this case, the co-ossified vertebrae were interpreted by the authors as “representing diffuse idiopathic skeletal hyperostosis (DISH)” - a non-pathological skeletal fusion that provided support for a suggested heterocercal tail in mosasaurs. Scale bar under photograph = 10 cm. "OUCH! That must have hurt!!!" Below are photographs of the right side of the skull of a Tylosaurus proriger that I saw in an exhibit in a small museum in Hobetsu, Japan. The specimen (HMG-1288) had been discovered in the Smoky Hill Chalk of western Kansas and purchased by the museum for their exhibits. 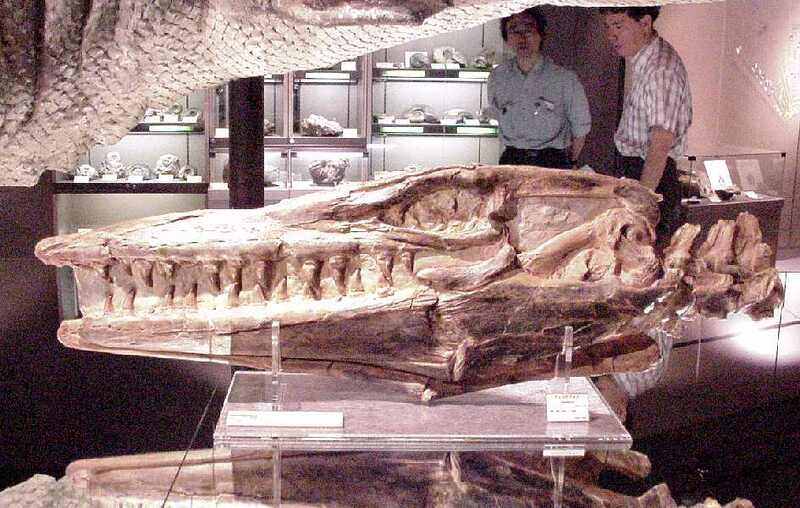 While the left side of the 1.2 m skull appears undamaged, the broken bones on the right side suggest that this mosasaur ran into something hard, like a rock. (LEFT) A large area of damaged bone was visible on the right side of premaxilla and a fracture was evident in the suture between the premaxilla and right maxilla. The unusual 'humped' silhouette of the skull may indicate an additional fracture of the posterior extension of the premaxillae. (CENTER) This picture shows the extent of the damage to the suture between the right maxilla and the premaxilla, including the rearward displacement of the first tooth in the right maxilla. (RIGHT) The appearance of the bone in this picture appears to indicate that some healing had taken place before the mosasaur died. According to Gorden Bell (pers. 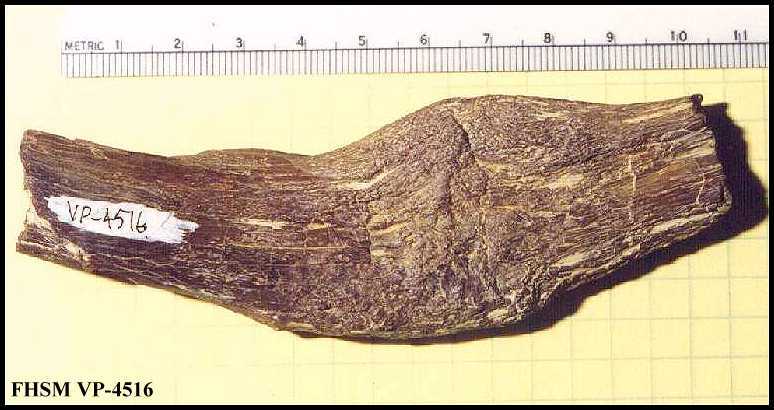 comm., 2002), the snout of a mosasaur was very well equipped with nerve endings... and this sort of injury would have been extremely painful. 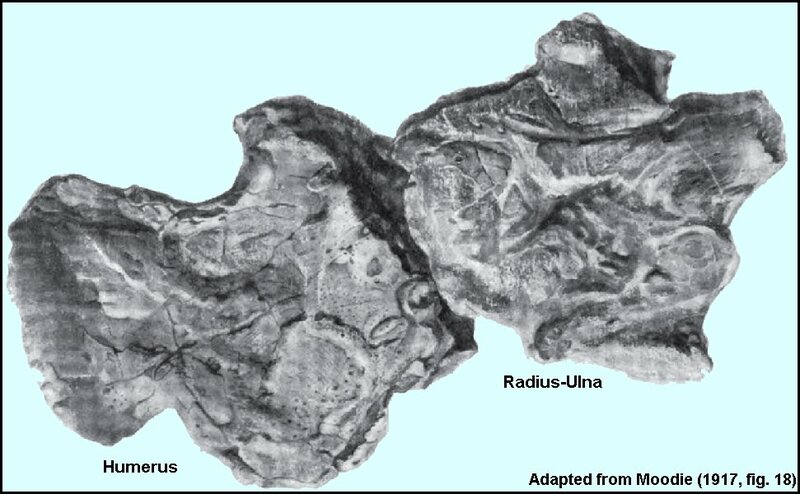 Rothschild and Martin (1987) discussed what appears to be evidence of avascular necrosis (the bends or decompression sickness) in the vertebrae of mosasaurs. If true, it means that mosasaurs were apparently not well adapted for deep diving. 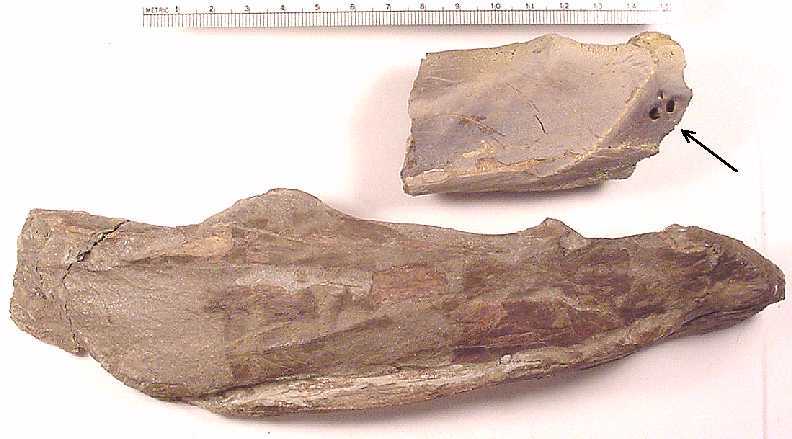 Below are several pictures of a fragment at the back of a mosasaurs left, lower jaw (surangular and articular). The breaks on both ends are fresh, but no other pieces were found. 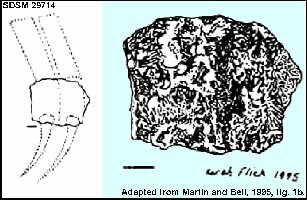 This bone fragment is the portion colored yellow in the drawing at left. In life, it served as the attachment (hinge) point between the left lower jaw and the quadrate at the back of the skull. 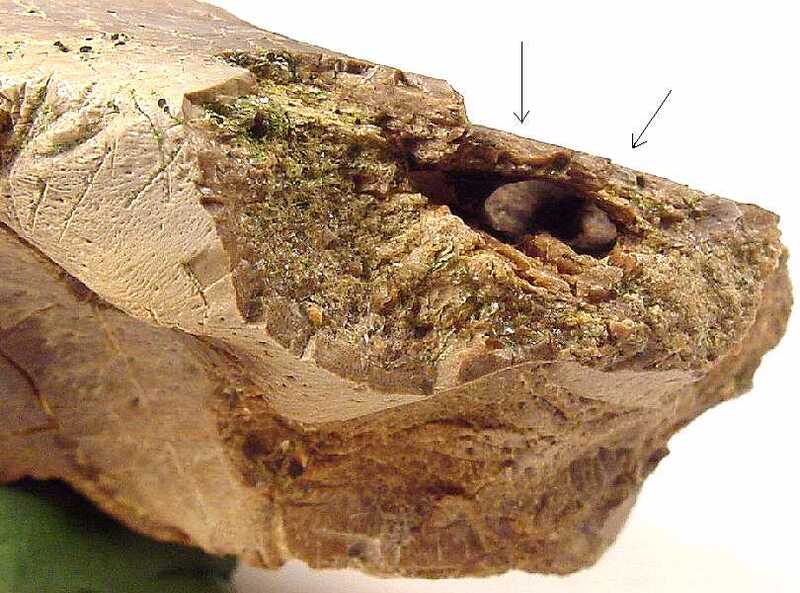 There are three oblong holes in the outside surface (arrows) of this fragment that may not belong there. The two larger holes (2 x 3 mm) are connected by a larger cavity which is barely visible as a light spot in the largest blow-up. The smaller upper hole is rounder in shape and all three holes seem to angle somewhat downward rather than going straight into the bone. The edges of all three holes are smooth and there is no sign of a recent bite trauma that I can see. 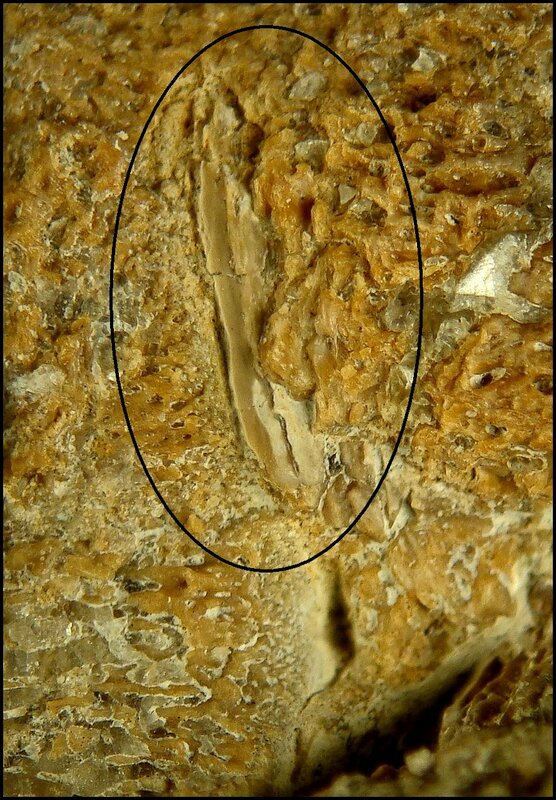 This isolated bone fragment was found in the lower Smoky Hill Chalk Member (late Coniacian) of the Niobrara Chalk in Gove County, Kansas. It probably came from an adult mosasaur (Platecarpus tympaniticus) that was 16-18 feet long. 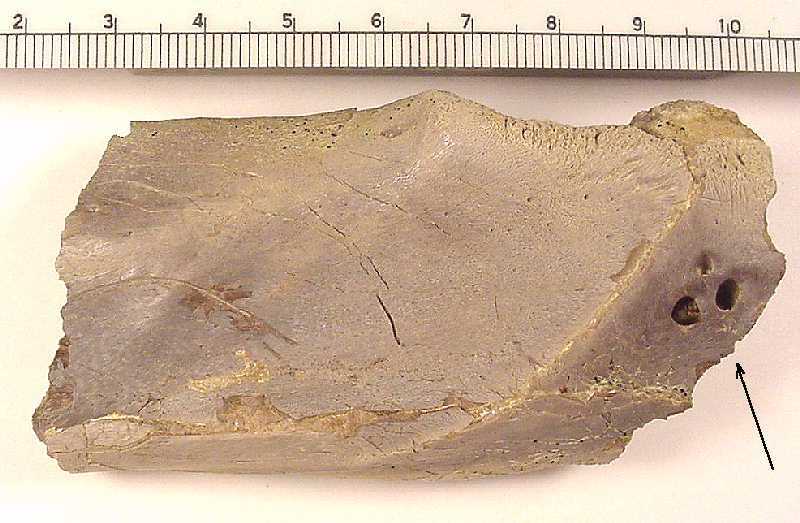 Bones preserved in the Smoky Hill Chalk Member frequently show marks from scavenging by sharks (mostly Squalicorax) but are very rarely, if ever, damaged by invertebrate borings. 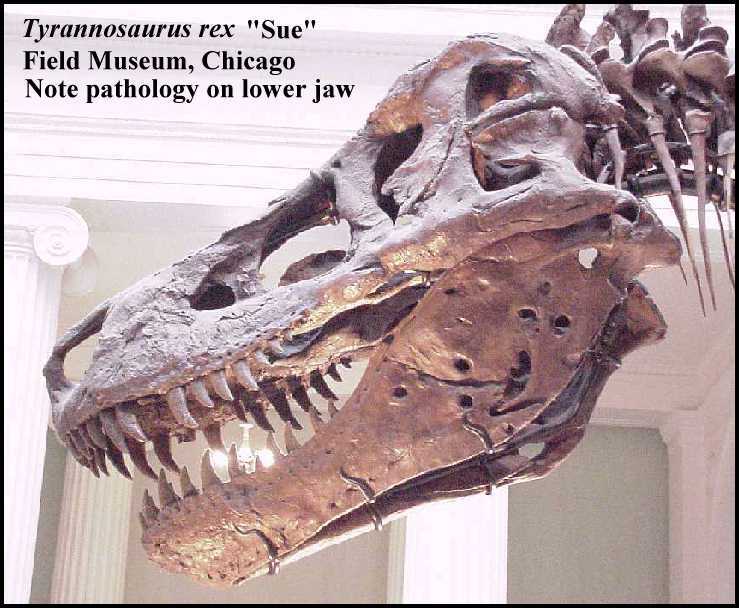 The openings look very similar to the unexplained holes in the back of both of the lower jaws of Sue, the Tyrannosaurus rex, but do not penetrate completely through the bone. The first close-up shows the location of the holes in the surface of the articular near the suture with the surangular. 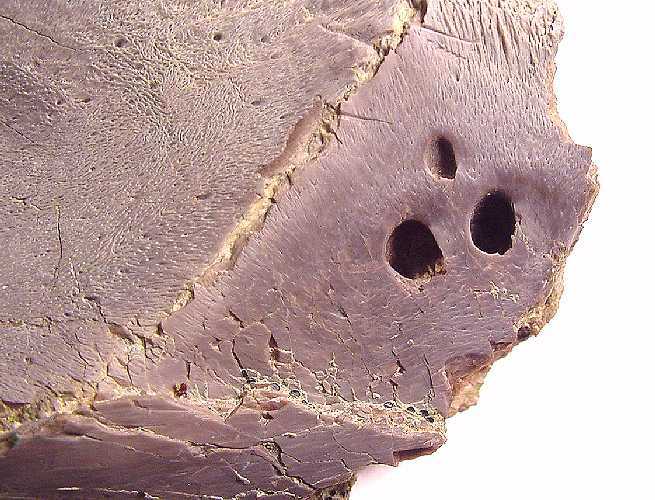 The second close-up gives a better view of the holes and the surface texture of the surrounding bone. The openings appear to angle downward toward the bottom of the picture. (Added 08/05/01) After I received a couple of replies to my initial inquiry, I decided that the broken end of the bone need further preparation. This picture is taken from different angle and shows the broken end of the articular and a cavity that projects toward the holes in the surface of the bone. This area had originally been filled with chalk. If you looked closely at the first close-up picture above, you might have noticed a semi-circular scratch on the left side of the fragment. These two pictures show the lower side of the bone and give you an idea of what your bones would look like if chewed on by a modern Mako Shark ..... In this case, the shark was Cretoxyrhina mantelli. 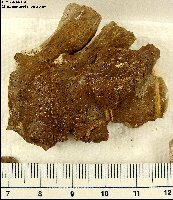 There should be no connection between the mystery holes in the bone and these post-mortem bite marks from scavenging. 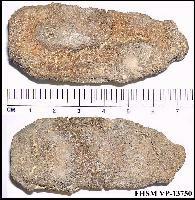 LEFT: Another specimen of a Platecarpus lower jaw (FHSM VP-2116) with three holes in the angular (inset). In this case, the holes are still filled with chalk so I am unable to determine how deep they are or if they are connected. I have seen several other specimens with similar pathology. 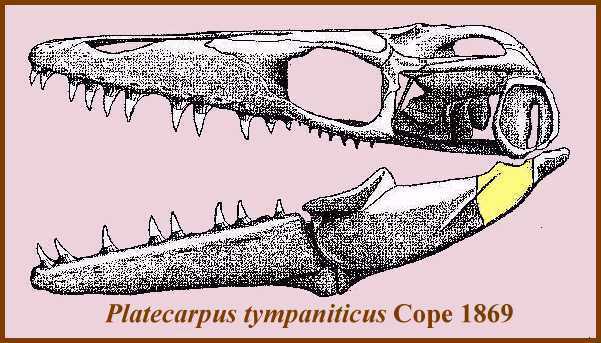 Credits: Platecarpus tympaniticus skull drawing adapted from: Russell, D. A., 1967. Systematics and morphology of American mosasaurs. Peabody Museum of Natural History, Yale University, Bulletin 23. Bardet, N. 2012. The mosasaur collection of the Muséum National d'Histoire Naturelle of Paris. Bull. Soc. géol. France 183(1):35-53. Martin, J.E. and Bell, G.L. Jr. 1995. Abnormal caudal vertebrae of mosasauridae from Late Cretaceous marine deposits of South Dakota. Proceedings of the South Dakota Academy of Science 74:23-27. Dollo L. 1882. Note sur l’ostéologie des Mosasauridae. Bulletin du Musee Royal d’histoire naturelle de Belgique 1(3):55-80, pls. IV-VI. Dollo, L. 1892. Novelle note sur l’osteologie des Mosasauriens. Bulletin de la Société Belge de Géologie, de Paléontologie et d'Hydrologie 6:219-259, pl. III-IV. Everhart, M.J. 2008. 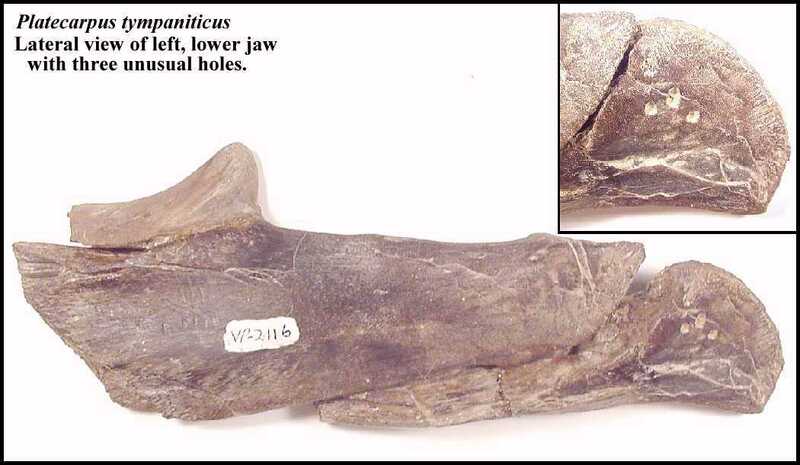 A bitten skull of Tylosaurus kansasensis (Squamata: Mosasauridae) and a review of mosasaur-on-mosasaur pathology in the fossil record. Kansas Academy of Science, Transactions 111(3/4):251-262. Gaudry, A. 1890. Les enchaînements du monde animal dans les temps géologiques: Fossiles secondaires. Librairie F. Savy, Paris, 323 pp. Lindgren, J., Jagt, J.W.M., and Caldwell, M.W. 2007. A fishy mosasaur: the axial skeleton of Plotosaurus. Lethaia 40: 153-160. Lingham-Soliar, T. 2004. Palaeopathology and injury in extinct mosasaurs (Lepidosauromorpha, Squamata) and implications for modern reptiles. Lethaia 37: 255-262. Martin, L. D. and Rothschild, B.M. 1989. Paleopathology and diving mosasaurs. American Scientist 77:460-467. Moodie, R.L. 1917. Studies in paleopathology. I. General consideration of the evidences of pathological conditions found among fossil animals. Annals of Medical History 1:374‑393. Moodie, R.L. 1918. Paleontological evidence of the antiquity of disease. The Scientific Monthly 7:265-281. Moodie, R.L. 1921. Status of our knowledge of Paleozoic pathology. Proceedings of the Paleontological Society, Bulletin of the Geological Society of America 32:321-325. Moodie, R.L. 1923. The Antiquity of Disease. University of Chicago Press. 148pp. Mudge, B.F. 1878. Geology of Kansas. Pages 60-63 in First Biennial Report of the Kansas State Board of Agriculture. Topeka. Mulder E.W. 1985. Beenvliesontsteking: een oude kwaal! Natuurhistorisch Maandblad 74(8):129-130. Mulder E.W.A. 2001. 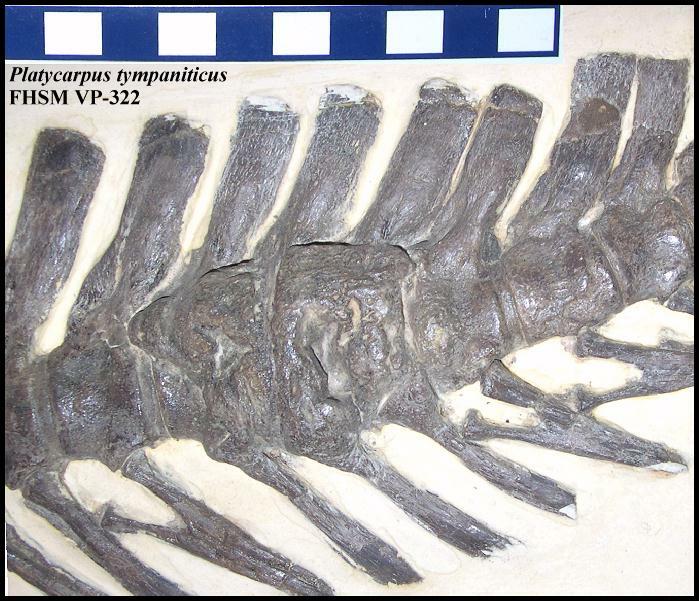 Co-ossified vertebrae of mosasaurs and cetaceans: implications for the mode of locomotion of extinct marine reptiles. Paleobiology 27(4):724-734. Rothschild, B. M. and Martin, L. 1987. Avascular necrosis: Occurrence in diving Cretaceous mosasaurs, Science, 236:75-77. Rothschild, B. M. and Martin, L. 1993. Paleopathology: disease in the fossil record, CRC Press. (Chapters 19 and 21). Russell, D.A. 1967. Systematics and morphology of American mosasaurs. Peabody Museum of Natural History, Yale University, Bulletin 23, 241 pp. Schulp, A.S., Walenkamp, G.H.I.M., Hofman, P.A. M., Rothschild, B. M. and Jagt, J.W. M. 2004. Rib fracture in Prognathodon saturator (Mosasauridae, Late Cretaceous). Netherlands Journal of Geosciences / Geologie en Mijnbouw 83(4): 251-254. Shimada, K. 1997. Paleoecological relationships of the late Cretaceous lamniform shark, Cretoxyrhina mantelli (Agassiz). Journal of Paleontology 71(5):926-933. Sternberg, C.H. 1909. The Life of a Fossil Hunter. Henry Holt and Company, 286 pp. Williston, S.W. 1914. Water reptiles of the past and present. Chicago Univ. Press. 251 pp.